This weekend, movie theaters across the country began screening The Monuments Men, directed and co-written by George Clooney, who also co-stars along with Matt Damon, Cate Blanchett, and John Goodman. 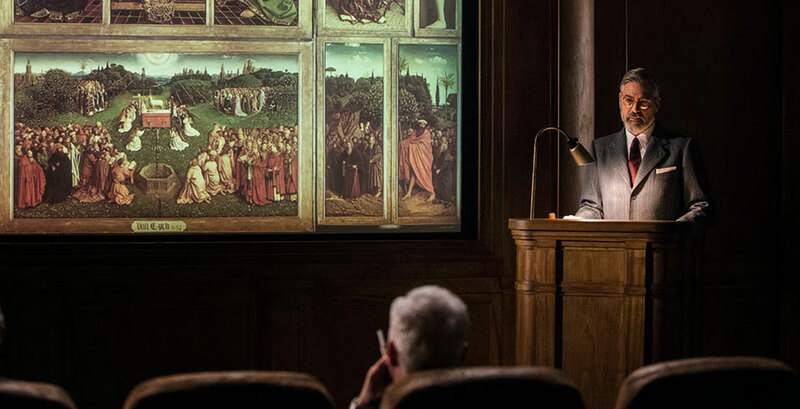 The Monuments Men chronicles the true story of a group of dedicated academics and art lovers who risked their lives to save priceless works of art in Nazi-occupied countries. The film has inspired many to highlight and remember the work of these men and women in preserving the art. Two Wellesley art professors, Myrtilla Avery (class of 1891) and Dieter Thimme, were part of the work during World War II. Avery retired from Wellesley in 1937, and went on to complete extensive research in her field. She also devoted her energies to volunteering for the American Council of Learned Societies. According to the Monuments Men Foundation website, the Council formed the Committee on the Protection of Cultural Treasures in War Areas in 1943. Headquartered at the Frick Reference Library and supported by the Rockefeller Foundation, the committee represented scholars and art historians like Avery and Dieter Thimme as well as collectors and world-renowned artists who compiled lists and made maps of the most important artworks and monuments in Nazi-occupied countries. This “master index” also included photographic archives of the works in question. The work of the Council complemented and supported the endeavors of the military men in Europe depicted in the film, as well as that of the Harvard Group, and members of the Metropolitan Museum of Art, among others. The quest to rescue works of art must have been oddly familiar for Avery, who knew Wellesley before and after the College Hall Fire of March 17, 1914. On that night, Wellesley’s masterful main building burned to the ground in under four hours. Students evacuated the building safely and then formed lines to rescue as many of the artworks as possible. The resourcefulness and resilience of the Wellesley community during that time will be commemorated at this year’s centennial anniversary through a Davis Museum exhibit and accompanying events. A classical art historian, Dieter Thimme was born and educated in Germany, leaving Europe only in 1939. He moved to New York, where he studied and researched at New York University. It was during his time at NYU that he volunteered with the A.L.C. committee, where his expertise in classical sculpture and other arts, as well as his wide-ranging travels across Europe and the Mediterranean, would have aided the committee’s work. After the war ended, he taught briefly at Michigan State before joining the Wellesley art department. In addition to his teaching duties, he organized exhibits, such as one at Jewett Arts Center highlighting “Modern European Masters” from his personal collection of works by Picasso, Matisse, Kadinsky, and others. After you’ve seen The Monuments Men, continue exploring representations of art and cultural memory through film on campus. The Davis Museum will be hosting a series of film screenings in accompaniment to the Tony Matelli: New Gravity exhibit, with screenings of 2001: A Space Odyssey and Gravity. And starting on Sunday, February 9, the recurring Cinephile Sundays series will linger nostalgically over cinema’s remarkable explorations of memory. Thanks to Jane Callahan and the Wellesley Archives Collection for help with this story.